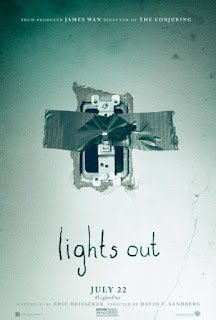 From the moment I saw the trailer for horror film Lights Out, I was very interested in seeing what looked like a horror based on a slightly fresher idea than the usual ones that seem to be redone ad infinitum. I was able to watch it at the cinema last night and my thoughts basically revolve around three words: it was okay. The film follows the story of a boy (played by Gabriel Bateman) who just wants a good night’s sleep but can’t get one. The reason behind this is that the house he shares with his mentally troubled mother has a third, shadowy occupant who roams the hallways and generally creeps around in a way that would probably keep any one of us up at night. He flees to his sister (played by Teresa Palmer) for help, but it seems that nowhere is beyond the thing’s reach. The key idea for the film is that the creature/ghost/monster only really has power and appears when it’s dark. I really like this, probably because it harks back to many childhood fears that saw countless children rushing for the light switch when they thought something was lurking in the dark. As far as its use in Lights Out, I found it to be very effective. The film does a good job of building the tension, better so than actually being scary. An example is one of the first few times the apparition appears, crouching in an open doorway scratching on the floor with its back to the camera. It was pure silhouette, but when it stopped scratching and turned to look at the camera, my whole body chilled into goosebumps. Then the whole effect was pissed away by a standard jump-scare sequence, with the sound ramped up to silly levels, to try and raise the audience’s pulse rates. Predictable and a bit disappointing, even though you could kind of guess what the film would be like before even sitting in your cinema seat. The film didn't make me jump once. It creeped me out, as in my goose-bump example, so it did connect with me on some primal level, but it wasn’t particularly scary. Some of this is likely down to an affliction that many horror fans seem to have, a kind of immunity to jumps and frights that would make a more green viewer reach for the hand of the person next to them. On a more mundane level, I wasn’t a fan of the actor who played the young boy. I just didn’t think he really cut it, and I’m pretty sure near the end he actually looked at the camera when he wasn’t supposed to. The other acting was fine however, the sister was played particularly well I thought, although this did mainly seem to entail making her eyes get wider and wider. As far as the creature, it has a great audio signature that foreshadows its appearance, and being only visible in silhouette certainly adds to the suspense. As in most creature-features though, this film trips over the line of showing too much, in my opinion, particularly in a late scene where you see its face briefly. Leave some things to the imagination! Grumble over. Lights Out is a genuinely creepy, but not really scary, horror. It is worth watching but I would only give it 3/5. I think it could have been so much better. 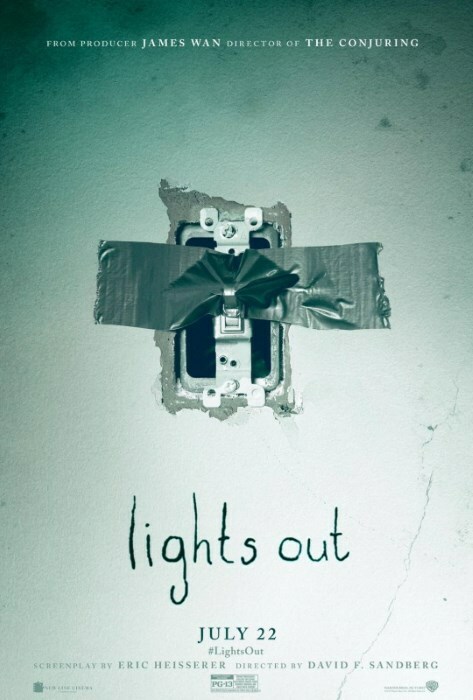 Lights Out Images © Copyright Warner Bros.
Labels: dark review, film, horror, Lights Out, Warner Bros.